I promise to get the following posts up soon! http://www.facebook.com/thebestCARblogever <– Lets keep in touch! My visit to CAR garages in Mumbai!! On November 6, I got a chance to visit two CAR garages here in Mumbai with my dad. Both belonged to his old-time friends who have been in this work for close to 45 years. The experience was a whole lot overwhelming and exciting than I could have ever thought. The first garage is ‘Ashok Auto’ located in Lower Parel, Mumbai. When I entered I had a silver Honda Accord (8th Gen) in front of me and on the left of it lie a Toyota Crown. I could see some one hiding in one corner in Red…and White. It was a Ford Mustang II in red with white rally stripes. I was so awed by its beauty, I spent atleast another half-an-hour going in circles around it, inspecting closely every inch of the beauty. All the original badges were intact, on the whole the car was in a pretty good condition (except it had a list of 20-odd things to be worked on). I got my hands a bit dirty around the Mustang II and even got its hood opened so that I could have a look inside the heart of the CAR. All original inside, except for the battery though, still ready to breathe again. I couldn’t get it fired up though, because it was being worked upon. But then, there were some other cars that would require my attention. On the right of the silver Accord lay three cars: a Mercedes Benz 2000, a Mercedes E320 and a Lincoln. Yes, a Lincoln. It wasn’t just another Lincoln, it was the TOWNCAR. 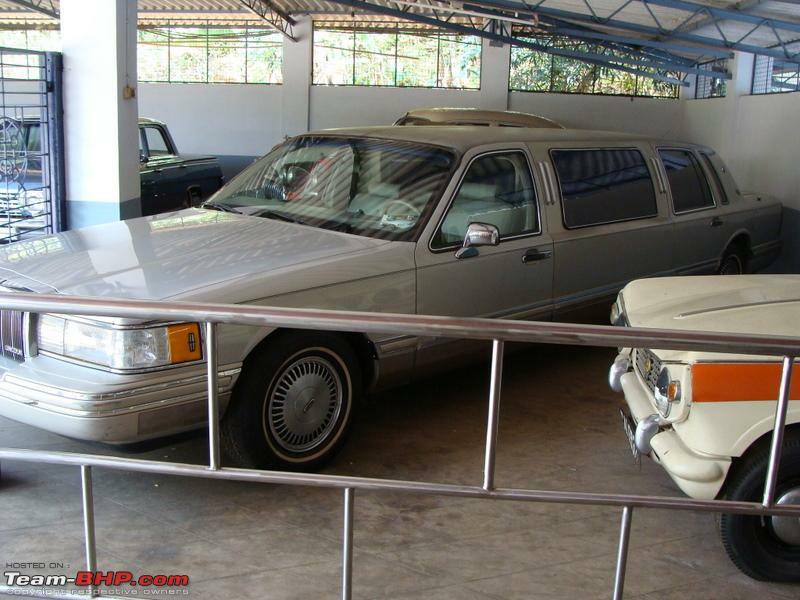 I am not sure whether it original comes in the form of a Limo, but then this one was. Moving forward was a Peugeot 309, whose body was being worked upon; re-fabrication and paint-job. Yes, there were other regular cars such as a Hyundai Accent, Honda Accord (7th Gen) and even a BMW 5-series. More interesting were the rares ones that were present there. Two of them, to be precise. A Toyota Celica 2.0 GTi, which wasn’t in a good condition though, but well I did keep looking at it again and again… and a Jaguar XJ6.. in a dark green shade with two gold strips going around the perimeter of the car, which was not in a pretty good condition. It was completely different from what a Jaguar sedan looks like nowadays. I could sense the difference, I could understand how far the design of cars have evolved. Didn’t get much time with the others (as I spent most of the time with the Mustang II), and really sorry for not being able to get any photos for them. Jaguar XJ6. While this one is in red, the one I got to see was of the color below. Jaguar XJ6. This color, but it didn’t have such sporty wheels. Volkswagen Beetle 1969. It was of this same color in the interiors, that’s from where you could tell its original color, since it’s outer body was mostly rusted.